Bring your bear for a reading adventure! CHILDREN are being encouraged to celebrate World Book Day in Tameside by bringing their teddy bears on a reading adventure. 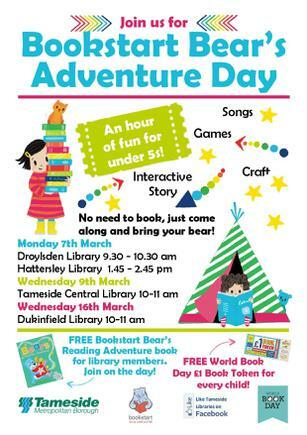 Tameside Libraries will be holding four free Bookstart Bear Adventure Days for under fives including interactive storytelling, games, songs, and craft activities. Every child will receive a free World Book Day £1 Book Token and there will be a free Bookstart Bear’s Reading Adventure book for library members. If you are not a member of the library you can join on the day. For more information about Bookstart Bear’s Adventure Day contact the libraries direct or contact Bookstart at book.start@tameside.gov.uk. For more upcoming activities visit the Tameside What’s On Online Calendar.